They’re also absolute gold, and definitely should be the book covers! I like the first cover, the second not really. It’s not good to hear but people do judge books by their cover. It’s also been a while but wasn’t the first book kinda dark? Compared to the light heartedness of the covers, maybe they are not the best fit for it? I think it would work for book 2 however since the first inn went boom and all. Ah well, just get all the patrons to give ya 4 or 5 star reviews – that should compensate for it, heh. Thank you for this. It was a really great resolution to the previous building tensions (seeing Tet, getting abandoned, frustrating Octavia) and interlude to the next set of tensions (dealing with the undead Tor, dealing with the necromancer goblin lord and his undead, dealing with the Necromancer and HIS undead, dealing wit….wait a second, what’s with all the undead????). Neither of the covers really seem to have anything to do with the stories. Did the artist actually read any of the chapters? Nah; this was done by a person on Reddit when I was talking about potential covers. It’s just for fun…although I’d bet a lot of readers did imagine a walking inn when they first heard about the story. I was thinking a teleporting inn. The ghostly building that came out of nowhere. – Come in and spend the night. Wake up and exit the building to find yourself in a brand new world. (And of course it would be gone by the time you turn around). Erin standing at the door to the inn that appeared out of nowhere trying to convince people the inn isn’t a giant mimic and that it won’t eat them. Of course the inn isn’t a mimic. Mimics that big are enormously rare…. All the tables and chairs and plates and silverware now…. Oh, and they’ve got a large selection of showtunes memorized, the better to entertain you during dinner. I Imagined an inn that was basically a huge carriage and was drawn around by horses or something, maybe by magic aswell. Possibly it could become compact or something like that to become easier to drag around. I don’t especially like to criticize but Fools’ day is long gone, so what’s with these covers, or better said, these sad hack job of collages that objectively represent the some of the worst, human creative endeavor could accomplish (well, together with this sentence, probably). I won’t comment on font choices because they are the topping. And why is there the Taj Mahal? I mean, we are not exactly talking about high literature here (not that it has any kind of monopoly on good covers) but your books deserve a zillion times better covers IMO. But seriously, thanks for the possibility to rant, I don’t really want to offend neither the one resposible nor the author. Um so I’m not a professional but this looks like googled images were used in the collages and guess what random images on google are not all free for commercial use and all that jazz. I did a quick search and using that second image would cost $400 probably? Or rather, using the non-watermarked version would. That cover clearly used the watermarked version and photoshopped it out, which doesn’t sound very legal. Say, how would you feel about fan art of the story? Not photo-edits like those two covers, but actual drawn fan art, on paper? I’m not the best artist but I’m not terrible either, and I’ve been willing to give your wonderful characters a shot. I’d never turn down fan art! If anyone sends me stuff, I guess I’ll make a part of the site devoted to fan art and fan works. But again, don’t do anything you don’t feel like doing. This was a delight to read! Made my not-so-good day and motivated me to get on with my own digital arts! Leave a typo for the barfight, staple of the fantasy story! “Can we about all that stuff over dinner? now, they she’d lost her fingers. One thing seems strange to me. Ryoka’s answer doesn’t really fit..
Erin asked her if magic was used to bring Ryoka into the shop, but Ryoka answered with “no”, although magic was indeed used. Even if her answer was directed at Erin’s first question, namely “How did you do it”, then “no” would still not fit, as “How” isn’t a yes or no question. What is the Actual Distance between Celum and Liscor? paba, I noticed an irregularity in how you write City Watch from time to time. The search field should make it easier for you. You wrote “the Walled City” but it should be “A”, as there are more than just one Walled City. I’m pretty sure you mean [Tactician]. After all, [Strategist] is the advanced form of [Tactician], so there is no way they would get it FIRST. I just noticed that you’ve written in many past chapters either “Griffin Hunt” or “GroffON Hunt”. Which one is correct, by the way? Ryoka’s smile could have cured depression. Just in case though, Erin lowered *er* voice. Oh Erin. Crazy batty amazing Erin. Such a fun chapter! Got to love a good tavern brawl! Just wanted to say, this chapter was amazing! I’m really loving the interactions between Ryoka and Erin. This is the case for most inns and taverns in our world and here I guess. Food, good food especially, is often an incentive for patrons to buy more alcohol. Though the former has a decent income in and of itself, drinks are what keeps the money flowing in by and large. So… I wonder what Garis was about to say about Perusa. Haha! That’d be so human! Every 2nd or third chapter either makes me grin so hard my cheeks hurt, feel a huge sense of nostalgia, or in cases like today, opening laugh at the ending. Keep it up! I got really bored and made a long unit-comparison for the upcoming Wandering Inn boardgame on Reddit. This one explains how Erin and Ryoka match up when fighting Antinium Soldiers. Check it out if you’re bored. I was when I wrote it. Did Ryoka not learn any fire spells from that book? You didn’t give her any fire attacks. Your logic is flawed. Roaches are resistant to radiation poisoning, not fire. Have you watched the anime called terra formars? They got detailed information on how resistant roaches are. This was a fantastic chapter. I was grinning the whole way through. …(sigh) Wesle is going to gain a few levels in [Guardsman] before Erin is done with this town, isn’t he? The second cover is better but both are modern while this is really a fantasy story. They might not fit. However this chapter was great and I quite like the idea of Erin opening/helping other inns. 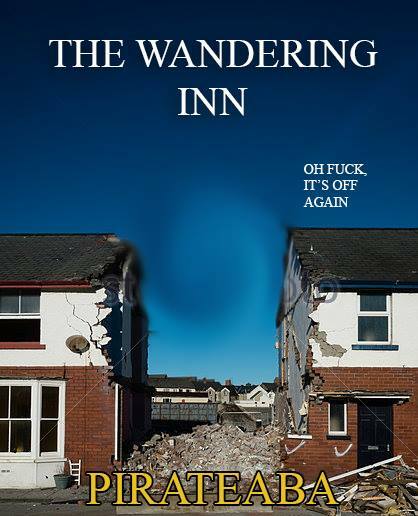 The Wandering Inn might finally be ‘wandering’. Those covers are abominations and I’m surprised my eyeballs didn’t pull themselves out of my head, go buy gasoline, and set themselves on fire. Having the default blank grey cover from Amazon would be better. There are many affordable artists out there, and you can ask on the LitRPG Society Facebook page for recommendations. Look at Secrets of the Old ones by Blaise Corvin, I believe that artist was cheap and professional. Maybe Erin should franchise. People could go to her inn, pick up a few levels, then leave to go start “The Wandering Inn of “. And Erin would get free help in her inn during those times, plus the monthly/yearly/whatever franchise fee. Awesome! They’ve both gone badass. Ryoka WINS a riddle game with a dragon, Erin invents more epic food, and flattens a bunch of uncouth barbarians with a table. Nice. God, Erin’s bubblyness is just so dang contagious. My phone died halfway through the chapter. I was laying down on my bed reading. The charger was barely two feet away. Hm, why aren’t there no rowdy female/women fighting? Both in Liscor’s inn, here in other places the males/man were the ones to have bar fights, get rowdy and so on. Up to this chapter, I’ve didn’t pay attention to that aspect, but, the scene got repetitive – in it’s used characters. Also, why, most time the female characters are those who are fighting against female characters – I’m talking about lastibg antagonistic relationships, not about the episodic ones? Maybe I’m wrong, but that’s the feeling that I keep having. Garia *Strongarm strode into the inn with a huge smile on her face.